I’m sharing a free excerpt of Deadly Ties! If winter weather has you shivering, visit Eagle Cove where it’s sizzling hot and mystery awaits! Come meet Maggie Porter and her dogs—a champion Labrador Retriever, an aging Cocker Spaniel, and a Beagle retired from federal service. Maggie’s returned home to reopen the family dog kennel business, where she’s plagued by problems from the start. Serious trouble arises when a gossip-loving employee turns up dead holding an heirloom locket belonging to Maggie’s mother. Anonymous threats and break-ins occur as the violence escalates, and Maggie becomes a target when she searches for answers. With her loyal dogs at her side, she must dig for the truth. Along the way, she learns that everyone has something to hide—and some secrets are worth killing for. The Dog Writers Association of America has announced the nominees for their annual writing competition. Fans of cozy mysteries will rejoice at the news that Sheila Webster Boneham has been nominated for her book Drop Dead on Recall (published by Midnight Ink). Sheila is a prolific–and highly talented–author of fiction, nonfiction, and poetry. At last count, she’s published 17 books about dogs and collected outstanding reviews, enthusiastic fans, and “best in category” awards along the way. Drop Dead on Recall is the first in her Animals in Focus mystery series; the second in the series is titled The Money Bird. If you’re looking for an entertaining “whodunit” featuring an engaging amateur sleuth, an insider’s view of the dog world, and–of course–wonderful dogs, you’ve found a series you’ll love! You can learn more about the books and about the author at her website. Order her books through her site or go straight to your favorite bookseller. Here in the Ozarks, we’re already trudging through snow and listening to the ice-coated trees creaking in the wind. It’s a good time to stay inside and enjoy a good book! If you’re looking for a mystery that’s fun and filled with dogs, start with Laurien Berenson’s Melanie Travis mystery series. 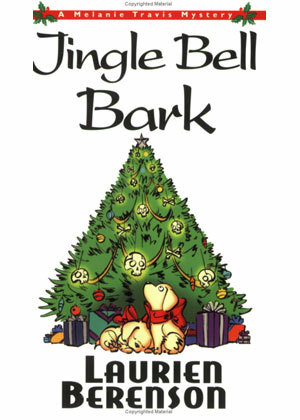 Jingle Bell Bark is a perfect choice for this time of year. The book is actually the 11th in the series but it’s a great read as a stand-alone cozy mystery, too. Ms. Berenson is a great writer, and a four-time winner of the Maxwell Award, presented by the Dog Writers Association of America. You can find her online and get the latest news about this engaging series! And as much as authors would love to see books on your gift list, there’s something else we hope we don’t see on that list–pets! As exciting as it might sound, bringing a dog or cat into your household during the holiday season creates a lot of stress and that isn’t a good way to begin a long and loving relationship. As the American Kennel Club reminds us, puppies are not stocking stuffers! Check this article for the AKC’s suggestions for a safe holiday season with all your beloved pets. And while you’re at it, be sure to read the ASPCA’s tips for watching your pet’s waistline during the holidays!